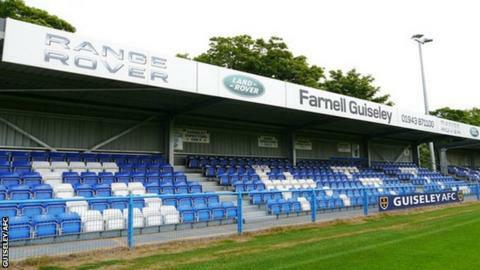 Guiseley have called events in the home draw against Braintree "regrettable", following an equaliser which was scored after the visitors had kicked the ball out of play for an injured player. After Guiseley's Ollie Norburn lobbed Tom King from the throw-in, Braintree expected to be allowed a walk-in goal. But Mark Bower's side played on, and the National League game finished 1-1. "They decided a draw was more important than their integrity and reputation," Iron boss Danny Cowley told BBC Sport. "For me, my integrity and dignity is worth much more than that." Guiseley manager Bower said on Saturday that goalkeeper King "stood there with his arms in the air and allowed the ball to go in to the net". Lions chairman Phil Rogerson said in a statement on Monday: "Having had time to sleep (or not) on the incident on Saturday, myself, Mark and the club find the situation most regrettable and not in line with the general ethos of Guiseley AFC. Fair play is and always has been at the heart of the club. "The decision to continue playing as normal after the goal was taken on the spur of the moment and under extreme pressure, not helped at all by the heated atmosphere." He added that he was advised by match referee Tom Nield the goal would have to be reported to the Football Association as an exceptional incident. Cowley alleged that the referee had asked Bower to allow the Iron to score following Norburn's goal, an accusation Guiseley have categorically denied. And Cowley said he bears no grudges toward the referee, adding: "For me it's not the referee's fault. He has to referee the game within the laws. It's up to us as players and managers to play within the spirit of the game and on this occasion that's been broken. "We're disappointed with that, but we have to draw a line under the incident and carry the emotion - we have to make sure we use this to bring us closer together as a group. "Ultimately, you either get bitter or get better after situations like this, and we're going to choose to get better." The National League said it is "not prudent to make any comment until the outcomes of any FA investigation are made official". Braintree are one point outside of the play-offs following Saturday's draw, while Guiseley are 18th in the table.